The #1 combo at Bellevue’s Southgate Garden, ready for do-it-yourself grilling, comes with brisket, short rib and pork belly. For galbi, bulgogi and banchan, the tastiest spots in the area. When it opened in 2014, chic, sleek Trove created quite a buzz. An upscale update on grill-it-at-your-table Korean barbecue joints, the Capitol Hill spot was brought to you by the chefs of lauded restaurants Joule and Revel. And while it was a novel concept — the 4,000-square-foot space also houses a noodle bar, a regular bar and a built-in ice-cream truck dispensing fancied-up soft-serve parfaits — the cuisine has long had a home in this area. 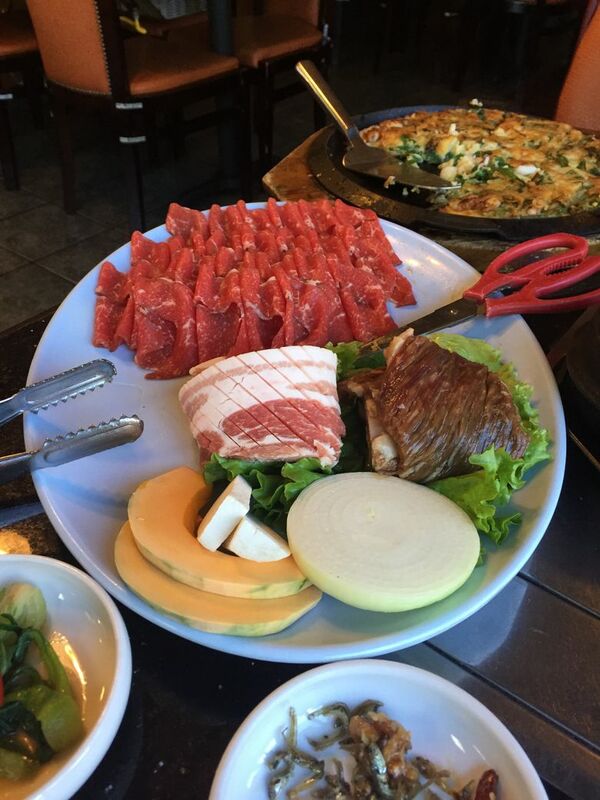 These five local old-school Korean barbecue favorites are more worn, but no less delicious. “People always say they can smell it in the parking lot,” the hostess told us, and it’s true: Old Village’s combo of gas grill and hardwood lump charcoal makes for a savory smokiness you sense before you even get through the door. This longtime favorite on Aurora feels loungelike, with black booths, decorative woodwork, K-pop videos on flatscreens and dimmer lighting than most. It’d make for a fun date, but you’d want to sit side by side; the exhaust hood for the grill’s smoke goes so low, it obscures whoever’s across from you. Everyone’s likely to be focused on the fire anyway. The bulgogi beef ($24.95/platter) goes on glistening ruby-red, and given a slight char, becomes the kind of salty-sweet that’s difficult to not compulsively eat. Assorted seafood ($33.95/platter) includes calamari, shrimp, two small scallops, two regular-sized mussels and two big oysters — more abundant than it sounds, with everything fresh-tasting and cooked, by you, exactly how you like it. A standout in the Lynnwood Korean cuisine constellation, Sura isn’t much to look at. An unassuming exterior is matched by an even less assuming interior of vinyl booths and restaurant supply-store chairs. But the meat is right. The galbi, which will run you $29.99, comes in alluringly well-marbled slabs that are thick enough to take a good char from the DIY grill while remaining a pleasingly pink medium-rare in the center. The bulgogi, $28.95, hits exactly the right notes of savory and sweet. And luckily, it makes great leftovers, since the servings here are copious. The fire baby octopus — complete with perfectly spongy rice cakes — is cooked at the table and is enough to feed three or four on its own. Don’t be intimidated by the name: The spice level is ideal. The seafood pancake is also worth trying, with just the right combination of soft and crisp. It’s a natural extension of something already gluttonously great: all-you-can-eat Korean barbecue, awaiting your mouth at Palace BBQ in either Bellevue or Federal Way. Ka Won sits in an unpropitious strip mall off the Mukilteo Speedway, surrounded by an acre of parking and untended landscaping. But gems like this are often found tucked in some no man’s land, aren’t they? This Lynnwood spot (you’ll need your GPS) has a big following in the North End. Get the special barbecue combo, listed on the menu under “A8, option A”. The hostess on the phone said it’s enough food for two, but she must have had two large linemen in mind. It’s enough for four. For $60, you get almost three pounds of pork belly, beef short ribs and squid to sizzle up on the communal grill, with a large bottle of Hite beer to wash them down. Sear those pork-belly slices over high heat. Simmer the other side over low heat. The result is a crispy, unctuous bite. You still have a zillion pork belly slices to go. Also included: a silky steamed soufflé-like egg dish, a giant salad and rice. Skip the accompanied bland tofu soup. There are 10 to 12 banchan to sample, small bowls of kimchi and other spicy nibbles including some addictingly crispy fish cakes. Housed in what looks like a former Denny’s, this spot just off Interstate 90 is nonetheless quite popular with the well-heeled Eastside Korean community. At $45.95, the #1 combo — composed of paper-thin brisket slices, a well-marinated short rib cut and two intimidatingly thick slices of pork belly — is more than enough for two hungry diners. Beefy but slight, the brisket benefits greatly from the fermented soy and chili paste and lettuce wraps served on the side. The short rib needs no embellishment, save a few moments on the grill. The pork belly is not for the faint of heart — though your heart may be somewhat more faint after eating it. Essentially a triple thick cut of uncured bacon, it’s best consumed in piglet portions. Brian Thomas Gallagher: 206-382-2827 or bgallagher@seattletimes.com. Brian Thomas Gallagher is a Seattle Times assistant features editor.